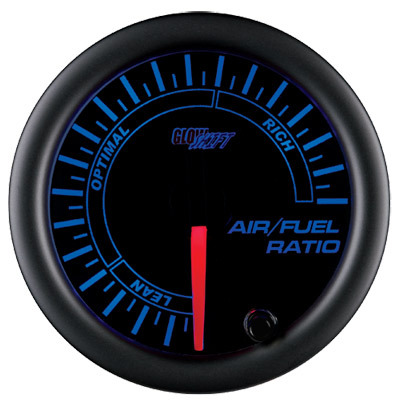 GlowShift’s Black 7 Color Series Narrowband Air/Fuel Ratio Gauge allows you to monitor your engines air to fuel mixture, ensuring it is at optimal levels, resulting in reduced emissions and better fuel economy. 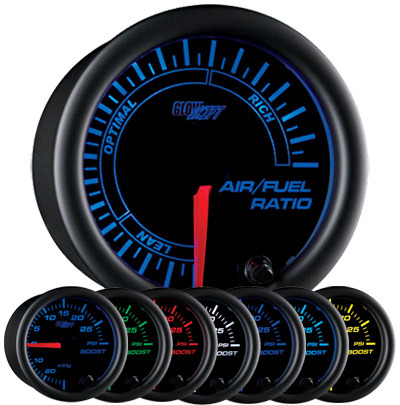 This gauge will give you a good estimate of your vehicle’s air/fuel mixture, but if you are looking to really tune your vehicle we recommend purchasing GlowShift’s Wideband Air/Fuel Ratio Gauge. This narrowband air to fuel ratio gauge is easily installed with the included color coded wire harness that lets you connect the gauge directly to your vehicles existing narrowband oxygen sensor. GlowShift’s narrowband air/fuel gauge includes some incredible features like stepper motor technology, 7 color through dial lighting, an easy to read magnified lens, as well as an illuminated red needle that will sweep 270 degrees. 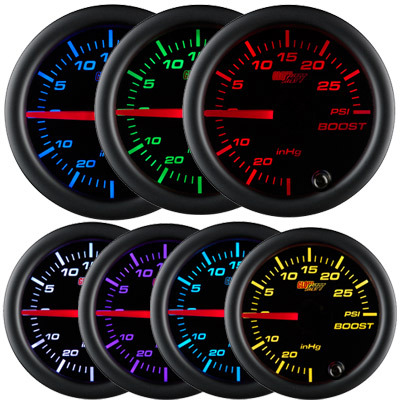 The included stepper motor gives this gauge the perfect combination of smooth needle movement along with incredibly accurate readings, and GlowShift’s 7 Color through dial lighting allows you to select from 7 different solid color modes or 2 color cycle modes, letting you to match your factory dash lights or add a custom look to the interior of your vehicle. This air/fuel ratio gauge will also dim 30% for easier night time driving by simply connecting it to your factory headlight switch, and with the color memory recall feature you don’t need to worry about adjusting the color of your gauge every time you turn your vehicle on. GlowShift stands behind all of its products by including free lifetime technical support and a one year limited warranty with every gauge purchase.